This signature offering is an inspired combination of pro tried-and-tested gain circuits in one unit, providing a virtually unlimited array of natural-sounding distortion effects. F’N awesome! Excellent transparency and retention of guitar characteristics/playing dynamics. Interacts well with guitar volume and tone controls. Four jacks/separate connections may be useful for some. Buffered/true bypass option not selectable. The Magpie Salute guitarist has been a fan of BMF Effects for years and this signature pedal is an inspired combination of two pre-existing circuits. 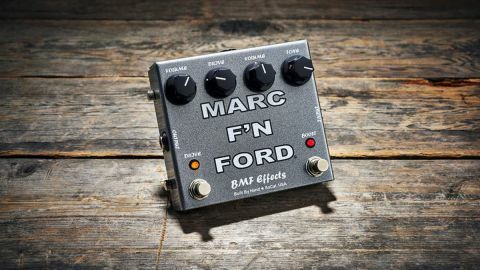 The boost side of the Marc F’N Ford comprises BMF Effects’ GB Boost circuit - a design based upon the vintage classic Dallas Rangemaster germanium treble booster used by Tony Iommi, Brian May and Rory Gallagher, among others. In addition to the Rangemaster’s single volume/level knob, however, a tone knob allows blending between two different values of input capacitor and provides greater control over signal voicing. The drive side features BMF Effects’ Purple Nurple overdrive - a simple IC-driven circuit with volume and drive controls, which progresses from a gritty clean boost to tweed-like breakup with a little sag and mild fuzz. Hit it with the germanium booster and the typical Rangemaster sparkle brings it alive with a gentle compression - this softens the whole thing up without losing ‘transparency’/clarity and detail of your guitar’s pickup sound. Switching between circuits provides a unique choice of versatile gain flavours, but using both sides together is where the magic really happens. When tested with single coils and humbuckers, the sound is harmonically rich, clear and expressive with a slightly pronounced vocal midrange. At higher gain settings, backing off the guitar’s volume knob enables good germanium transistor-style clean-up, which retains a fullness of tone and encourages further exploration of the instrument itself.